The Java Argument Generator is a simple, easy to use program intended to generate an argument made to speed up Minecraft. 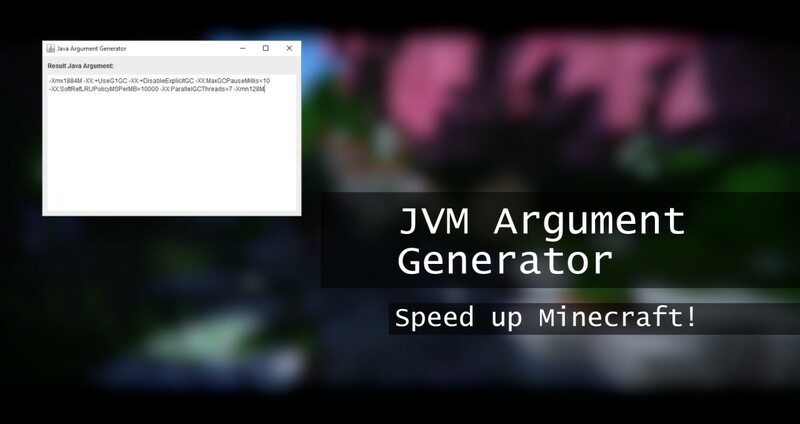 All you have to do is copy and paste the text in the box into your Minecraft profile under JVM Arguments! The argument works by enabling Garbage Collecting on Java, which increases how much Java clears useless memory. 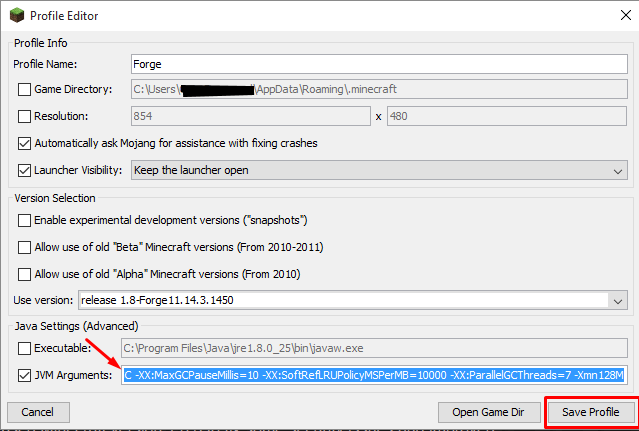 The program also detects how much memory your version of Java is willing to use, and sets that as the maximum memory for Minecraft to use. This makes the argument great for use in modpacks, and the Shader mod. Give it a Download and try it out! 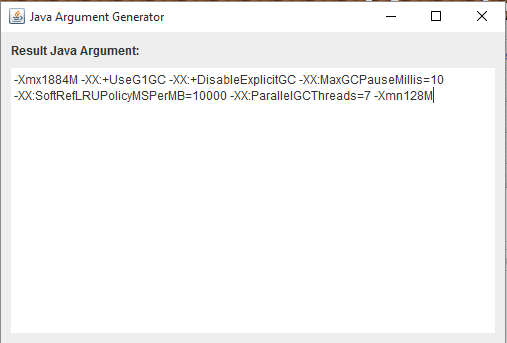 Step 1: Launch Java Argument Generator.jar and copy the text in the text box. 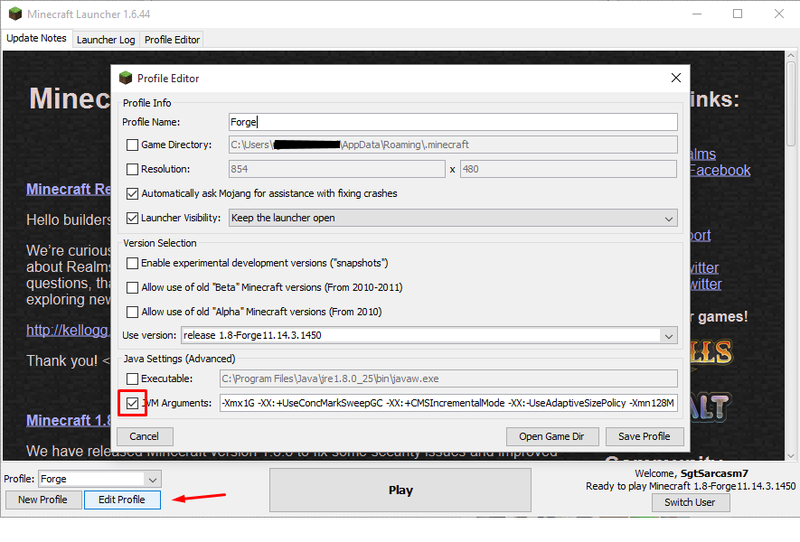 Step 2: Open your Minecraft launcher, select the version you wish to apply the argument to, and click edit profile. Make sure the JVM Arguments checkbox is checked. Step 3: Paste the text into the JVM Arguments text box, and click Save Profile. Step 4: Play Minecraft. You're all done! Let me know how this program works for you, if there are any bugs, and any advice for improvement onto the argument you may have. This is one of my first programs I've released for public use, so let me know how it works and how well Minecraft runs after that. Remember, this argument isn't necessarily intended for just vanilla Minecraft. It is intended for use in modpacks and memory/CPU intensive mods. So, if you use it in vanilla Minecraft or a version with few mods, you may not notice much of a difference. And yes, I know the preview image for the project is exceptionally bad. A Java exception has occured: This usually happens with outdated versions of Java, check if you have the latest version installed before reporting your problem or running the program again. This can also happen if you have the wrong architecture of Java installed, such as Java 64 bit on a 32 bit system. This can be fixed by uninstalling Java and installing the correct version. Though if you have a 64 bit system, it is recommended to have both Java 64 bit and 32 bit to reduce compatibility errors. If you have any trouble filling out the outline for error reporting, let me know and I'll clear up any confusion. If you liked it, leave a diamond, favorite, and subscribe. Added a section in description including known errors involving the program. Users can cross reference this section for ways to solve certain problems that I cannot fix. Because sometimes, problems with the user's computer prevent the program from working properly. it wont run. is there a mistake in the download? The download itself won't make the application just not work. Do you have Java installed and updated? If not, install/update Java. i have java.does the app nead to be the java folder? Nope, what version of Java do you have? Hmm, should be working. I'm not sure, I may work on the application and update it sometime but I've got a lot on my plate. Source code? I want to use it for a server, but I can only access it through the terminal. I could give you the source but it's not recommended to use it on a server. The arguments generated were originally picked out with clients in mind rather than servers, and I haven't tested it out on one yet. However, if you really want to, if you're using a rented server you should be able to upload the program to your server and run it as you would any other external file (if you have an option for that) and if you're running it on a home server it should be even easier. If you need help getting it to run on a server, just let me know exactly what you need to do and I'll help you out to the best of my ability. I have a computer slave in my basement I use for my server. To save on RAM, it doesn't have any GUI support, so I need it to output the text into the terminal rather than in a window. I was getting an error every time I played modded 1.7.10 Minecraft until this. Does this work in the 1.9 snapshots..? It should work in all versions. Thanks for making such an awesome program! For those of you who actually read update logs, ignore the two "Update 3" logs. Both logs say the same thing just worded differently, because I guess I didn't realize I made a log already. It's early, okay? How did you do this, its the best thing for haveing a slow minecraft. I actually made this originally to optimize modpacks for people running Windows 8, then I realized everyone could use this. When I run it "A Java Exception has occurred" an error occurs. When you run the program, or Minecraft? If it's the program, your Java installation may not be installed correctly or some settings may have been changed that prevents certain values involving your system properties from being returned. What version(s) of Java are you running, and have you changed any settings? Also, what OS are you running Minecraft on? Java 1.7? Try installing Java 8. DUDE THIS IS AMAZING! I managed to reach 160+ FPS in Optifine with this! And 20+ FPS with Extreme Shaders! THANK YOU SO MUCH FOR POSTING THIS!!! What do you mean launch it? I try to open it with java and it says java exception error, when i open it with winrar there is nothing to launch inside it either. Can you give more clear instructions how to use it? A .jar is considered an archive, but what is inside is compressed and not meant to be launched. To launch, all you have to do is double click. If that didn't work, you may not have Java installed properly. Works perfectly. My game was so fast in fact that I went to log into Mineplex I logged in 2 times as fast. And switching from game to game on Mineplex literally felt like I was teleporting from place to place, where as before, it would take a second or 2. 10/10 better than optifine. How much memory do you have on your system, and what version of Java and it's architecture do you have? And, one more thing, what architecture is your system? By architecture I mean 32 or 64 bit. For checking Java architecture, go into Apps & features. This is the section of settings that shows what apps you have. Look for Java, tell me the version and if it has (64-bit) beside it. If it does, then you probably already have a 64 bit system so you can skip the second step. Second step is finding the architecture of your OS. Go to settings, system and then about, where it tells you information about your computer and current running OS. Find System type, tell me if it says 64-bit or not. Installed RAM should also be there, tell me what that says too. I'll have a working version of the program out soon, and the project should also be updated with it for information on finding system information that I may need to know. I have 16gigs total of RAM and am running java8 latest version, it's the x64 version same as my windows 10. hopefully that helps. I made a quick fix on the program, but I have no idea why Java would think you have a negative ammount of RAM. It may have to do with your Java settings, if you changed them to allocate more or less ram to it. So sadly, for now, it has to remove the memory segment of the argument if it returns a number under 512 megs. At that point, setting the memory to anything would be pointless. Thanks for the feedback, though! it thought he had a negative amount of ram because it was written -Xmx-486M, where it reads just 486. The string "-Xmx" does not contain a dash afterwards, so the variable must be returning a negative number. I can't see why it would do this, especially with how much RAM he has unless the Java settings were changed and that threw off the program. Thanks for the input, though! If you hadn't pointed that out I wouldn't have gone back and looked if that were the problem. You forgot to credit me for all of this, you scumbag.